Change is always happening. It’s one of the constants in life. Sometimes we can stop it and other times we are better off jumping in head first. Personally, I prefer routine and planning and don’t care much for change. I park in the same spot at work and church. I order the same entree at my favorite restaurants. I buy the same brands. Some might say that’s just because I like what I like but the truth is, I really struggle when things don’t go as I planned or when life throws an inevitable curveball. I try to go with the flow and be flexible but it’s not easy. It takes awhile for me to process and accept change. Research suggests this may be because people are most likely to resist change they are fearful of, don’t trust or they don’t understand the need for. Change can be a good thing. Regardless, it is inevitable and it is necessary. More often than not, change leads to growth and progress. As Ben Franklin said, “Life is ten percent what you make it and ninety percent how you take it.” Putting this into practice can be difficult and require us to push ourselves past the confines of our comfort zone. When we stop trying to fight change it can lead to great things as we enhance our knowledge and experiences. It allows growth and opportunities we would not otherwise experience. Everyone has a tolerance level to change; some handle change with ease and others struggle to fight the inevitable. Sometimes we understand why change is happening and other times it remains a mystery to us. Knowing the why can feel valuable but regardless of the why or if you agree with it, here are some helpful suggestions to improve your tolerance to change. Be realistic about what you are heading into. You cannot expect to try a new experience or learn a new skill and be perfect at first. While expectations can be good at helping up set goals, you might be placing unrealistic expectations on yourself or your relationships. Acknowledge change as part of life. Change will always be happening. Be aware that change will happen in your life. This means understanding that things can and will be different from how they are now or how you expect them to be. Acknowledging change is allowing it to happen instead of approaching it from a place of denial and resistance. Sometimes circumstances will not turn out the way you want them to and that is perfectly okay. Embracing the situation can help you deal with the change effectively. It helps you make the necessary shifts in your life to embrace the change and move forward from it. If you can get to the point where you accept change then you can begin to learn from each experience. Change can be a great teacher, if you are open to it. Think back to times in your life where you thought change was a bad thing. I bet you later discovered it had benefits or at the very least learned something from it. If there is a big change coming in your life. 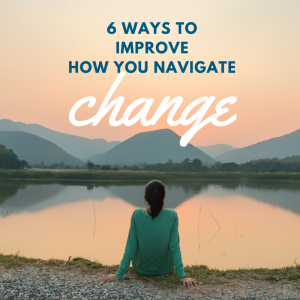 Take the time to arm yourself with as much knowledge about that change as possible. Having a clear understanding of what is coming can help but remember even if you can’t understand it or don’t agree with it, do your best to navigate it without resistance. Once you know that change is happening, take a moment to create a plan of action. Recognize that plans can change but this helps you to process your role in that change and feel more in control of your experience moving forward. If you find that change completely derails your life for a while or the notion of accepting change causes you anxiety or difficulty in your interpersonal relationships, then it may be time to reach out and seek some help. We are here to help you navigate all of life’s changes. We can help you process change, manage your expectations and anxieties and help you shift your perspective. Give us a call or schedule online today. If change creates anxiety for you, check out our related article, Radical Acceptance: 5 Ways to Free Yourself from Anxiety.